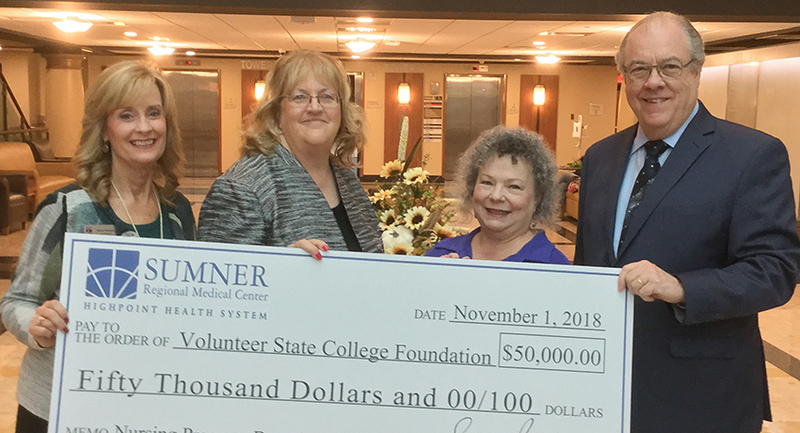 Sumner Regional Medical Center is the first of the area hospitals to commit support to the new Volunteer State Community College Nursing program, with a donation of $50,000. Vol State is taking the final steps to gain full approval for the new program. When final approval is received there will be an announcement about specifics. In the meantime, the Volunteer State College Foundation is seeking support for the startup costs. Pictured left to right: Karen Mitchell, executive director of the College Foundation; Susan Peach, market president, HighPoint Health System, and chief executive officer, Sumner Regional Medical Center; Linda Gibson, Vol State dean of Nursing; and Jerry Faulkner, Vol State president. For information about the Volunteer State College Foundation visit www.volstate.edu/foundation.